You are here: Home / Australia Travel Archives / Things to Do on Fraser Island. For Adventure Lovers! Things to Do on Fraser Island. For Adventure Lovers! Updated 21/04/2019 By Alyson Long. Any post on this site may contain affiliate links. If you use them, they cost you nothing extra. We make a small commission. A must-visit for adventure seekers, wildlife enthusiasts and beachgoers alike, Fraser Island is a sand island (the largest in the world, in fact!) located in southern Queensland. A popular spot for many people both backpacking in Australia, holidaying with friends or family or for locals, Fraser Island is definitely one for the bucket list. There are so many things to do on Fraser Island for people of all ages: so whether you fancy catching a gorgeous sunrise or sunset, four wheel driving through subtropical rainforest, swimming in an impossibly blue lake or bush camping – your needs will be met here. The native people of Fraser Island were the people. In their language, Fraser Island was known as K’gari (pronounced ‘gurri’). This word means ‘paradise’ in their local tongue – and when you reach the island, with its diverse flora, gorgeous beaches and glittering lakes, you’ll understand how the name was derived. Speaking of the Aboriginal people of the island, unspeakable atrocities happened to them when European settlers came to the country – like elsewhere in Australia. There are now only a handful of Butchulla people in Australia, some who live in the Fraser Coast region. It is very important to maintain respect for the traditional owners of this land while travelling Fraser Island. 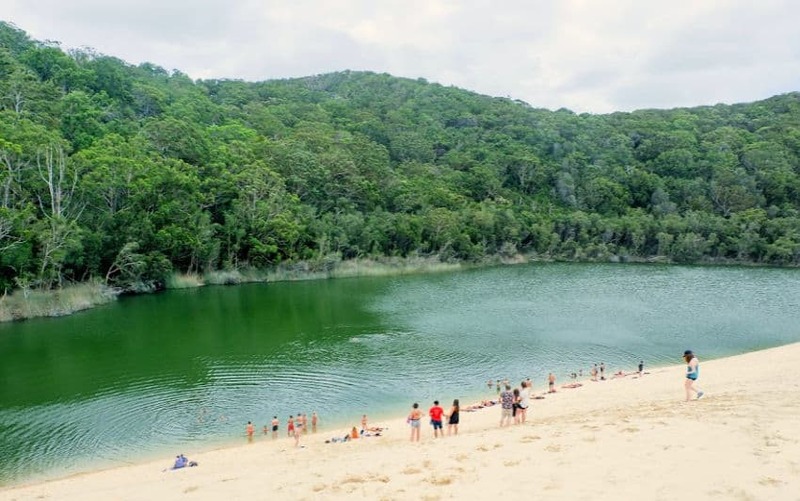 With its glittering waters and beautiful beachy surroundings, Lake Mackenzie is without a doubt one of the best things to do on Fraser Island. The drive there is not for the fainthearted – it’s down a steep, strictly 4WD track – but the reward once you get there makes it all worthwhile. Lake Meckenzie is ‘perched’; it contains only rainwater, has no groundwater and is not connected to streams or the ocean. The sand here acts as a filter, which makes the water so clear and pure, giving it a mesmerizing bluey-green hue. The water is safe for swimming, and a leisurely afternoon can be spent on the banks gazing at the beautiful scenery. There are also some short walking trails around the area. The highest point on the island, Indian Head offers a spectacular vantage point around this area of the island. The view spreads over the beach and the seas. It takes about 20 minutes to walk to the top, and is steep in some parts. Some parts of the area are quite slippery and precarious, but it’s a fairly easy walk for anyone of average fitness. Keep an eye with children! From the top you may be able to look into the ocean and see turtles, manta rays, fish and sometimes even sharks and dolphins. Best Blog Read Now! What Does A Homeschool Day Look Like? A wonderful lazy river where you can go tubing, floating on Eli Creek is one of the more unique things to do on Fraser Island. If you’re travelling independently, bring some rubber rings for the adventure (they will be provided if you are on a tour) and drift happily around! The current will drag you from the start to finish, and as it is located right by the beach you can relax in the sun around the edge as well. As it’s not recommended to swim in the sea due to the large population of sharks, rips, rough seas and jellyfish (basically everything that Australia is known to be dangerous for! ), Eli Creek is a great place to cool off and refresh after a hard morning’s four-wheel driving. Known as Fraser Island’s highway, with a speed limit and police on patrol (seriously! ), driving along 75 mile beach is a bucket list experience like no other. The road is smooth for the most, with a few bumps. There are strict road rules as it is classed as a highway, so you have to drive on the right, not speed and don’t even think about driving if you’ve had a drink. Driving along 75 mile beach can sometimes be dangerous, especially when large waves and dips in the sand occur at the same time. Make sure you have some 4WD know-how before taking it on! You know I mentioned that you shouldn’t swim off Fraser Island? Its seas have claimed many a boat throughout the years, the most famous being the Maheno Shipwreck. It is over 110 years old now, and is protected by the Commonwealth’s Historic Shipwrecks Act 1976. The shipwreck is located on 75 mile beach, which was built in 1905 as a turbine steamer for the Union Steam Navigation Company. It was the first of its kind to cross the Pacific Ocean and was used during the transportation of Allied troops from Gallipoli to Australia and New Zealand. It was July 1935 when the Maheno disappeared and was found on shore Fraser Island. 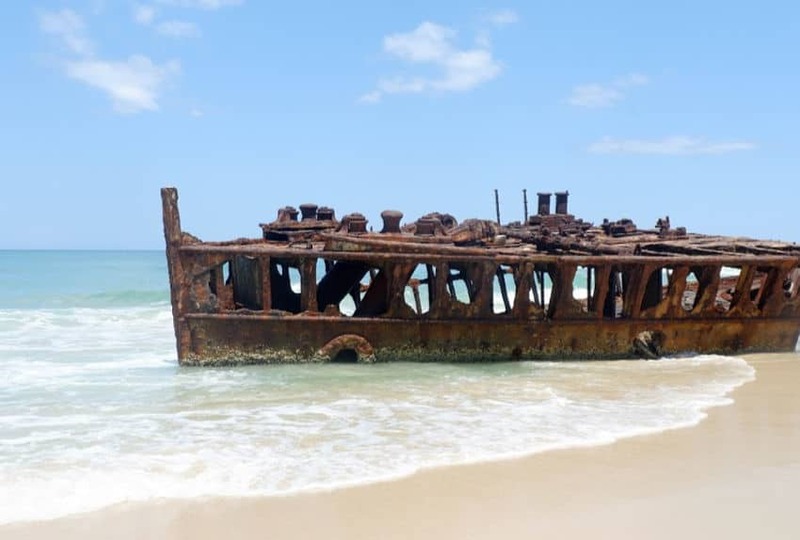 Rescuers were unable to salvage the wreck and it has been left there since; now enjoying fame as one of Fraser Island’s key landmarks. It’s a really interesting spot to visit and photograph; and makes for a great picnic background! Do you fancy soaking in a natural jacuzzi? Champagne Pools are just that. They were formed by volcanic rocks – and are the only place on the island where you can swim in saltwater! They are a scenic spot to relax in and photograph, and there’s lots of colourful marine life underneath the waters to enjoy. Their name comes from the foamy effect when the waves crash on the rocks, mimicking champagne foam. Keep away from the edges of the pools, as the waves are very strong as they come over! The deepest lake on the island, Lake Wabby is a great spot to visit. It’s a bit of a walk to get there, but you’ll be rewarded with beautiful rolling sand dunes cascading into a eden-like lake, which catfish, rainbow fish and other marine life call home. They don’t mind human visitors getting in for a swim though! It’s a bit of a walk to get there through the forest (and then a steep climb down the dunes!) but the hike makes the swim even more refreshing. As Wabby is a barrage lake, the sand dunes above will eventually move into the lake and occupy it. So enjoy it while it’s still there! Because of Fraser Island’s wildness – you won’t get much mobile reception anywhere on the island – it is full of bush camping opportunities. This is perfect for those who are seeking to spend some time engrossed in nature. So if you’ve got a sense of adventure, include a tent and sleeping bag to your Fraser Island packing list and head out bush! Make sure that you’re aware of the possible dangers of Fraser Island before heading out – potentially hazardous residents include dingoes, snakes and spiders – and how to act if you end up confronted with one. 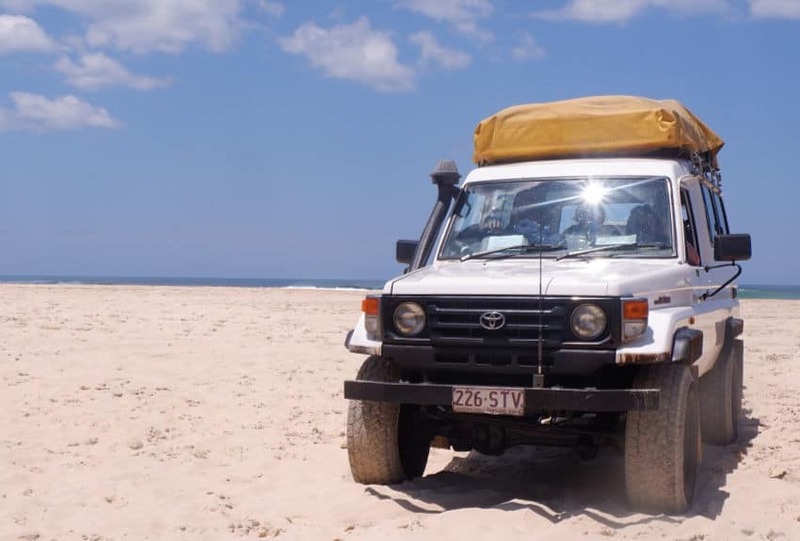 If you’re after blissful solitude while checking out the best things to do on Fraser Island, you’ll probably want to either take your own 4WD vehicle over or hire one. Doing so will enable you to experience Fraser Island at your own pace, drive along the beach and through bushland and stop wherever you fancy! It’s the ultimate freedom, and an exhilarating adventure. One of the most popular ways for people to see Fraser Island – particularly for backpackers travelling down the east coast – is to do a tag along tour. The tour is guided around the island, but everyone who wishes and who has a valid driving license gets the chance to drive the 4WD themselves. This is a great alternative to hiring or purchasing your own 4WD, which can be costly and comes with a lot of responsibility. Of course, if you don’t want to drive or do not have a license (you also have to be 21 to be able to drive the vehicles), you can just sit back and enjoy the views! Another great advantage to the tours is that it is easy to meet people, as the tour-goers spend 3 days together and navigate the roads and camp out together. There’s a great social scene every evening at the campsites, so it’s a really fun way to experience Fraser Island. The 90km great walk around Fraser Island takes 6-8 days to complete, or can be split into shorter walks. The walk encompasses mangrove forest, freshwater lakes and beaches. As well as checking out some of the usual hangouts, the hike travels toward the north of the island, to the Fraser that not so many tourists see. If you take on the K’gari Great Walk, you’ll have lots of times when you go for hours or even days without seeing anyone else! 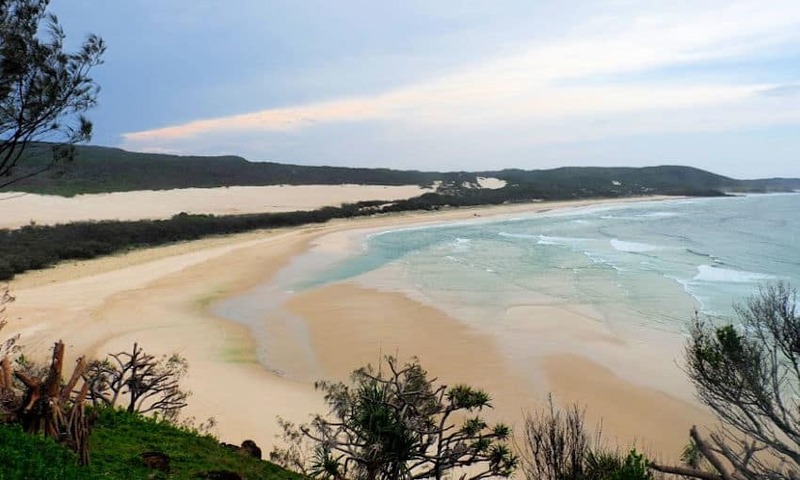 Fraser Island is pretty easy to access; you can reach it from Hervey Bay and Rainbow Beach. From Rainbow Beach, where many of the tours leave, it is a quick ferry ride (about 10 minutes) to Fraser Island. 4WD vehicles can drive straight onto the ferry. The ferry from Hervey Bay leaves River Heads (which is 20 minutes from Hervey Bay) daily and is about 30 minutes from the port to island. Hervey Bay is about a 3 hour 30 minute drive from Brisbane and Rainbow Beach is just a 3 hour drive. Both towns are serviced by the Greyhound coach service. 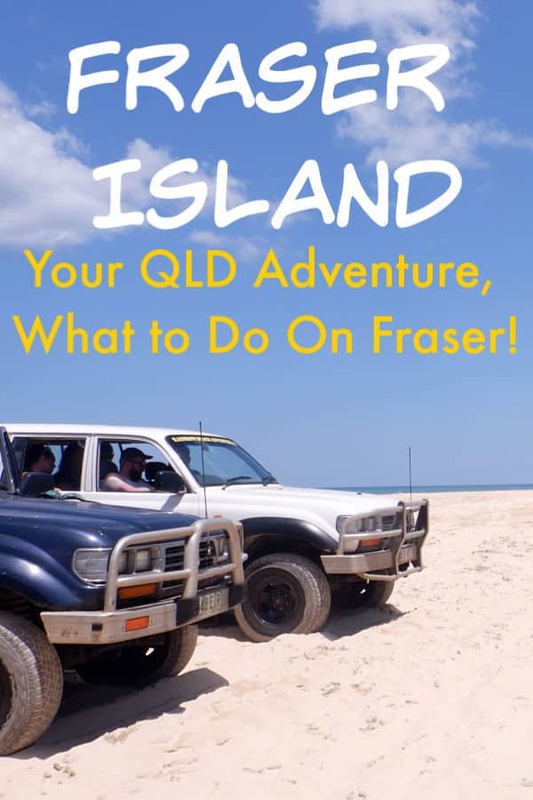 We asked a friend to help us with this post on things to do on Fraser Island. She knows Australia and Queensland very well and her knowledge of Fraser Island is far greater than ours. So thanks Claire! 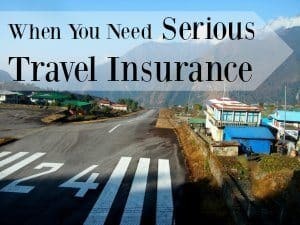 Claire Martin is a British travel blogger and freelance writer. She blogs about eco-travel and overland adventures on her blog Claire’s Footsteps ; she has driven around the entirety of Australia and is currently living in Mexico while plotting her next big overland adventure. For more information on travel in Australia, head back to our Australia Travel Blog page. 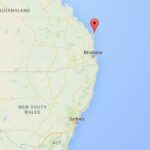 I’m heading to Fraser Island in March and was wondering if anyone knows if you can take dogs onto the island? No you can’t, unless it’s an assistance animal and then you need a special permit.